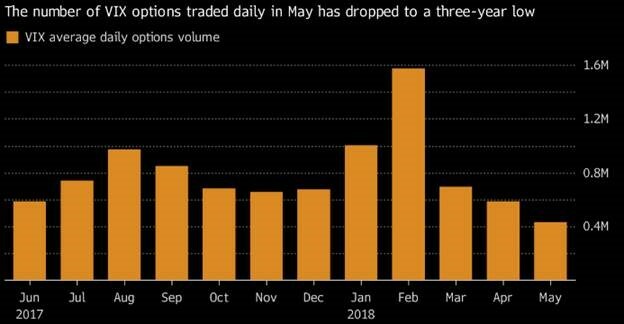 Traders’ interest in VIX options keeps on waning. 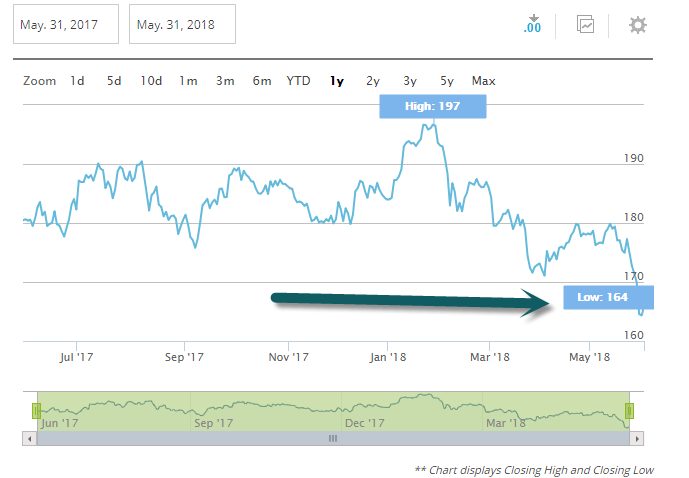 The collapse of a popular exchange-traded note amid a surge in market turmoil earlier this year helped send the number of Cboe Volatility Index contracts tumbling, and this month options volume has slumped to a three-year low. 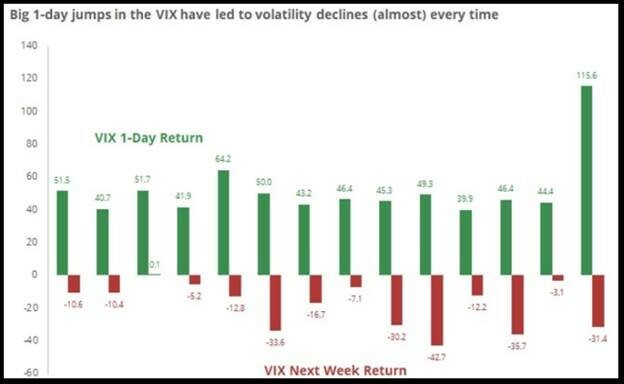 The VIX is heading for a May drop, a pattern that led to gains in June in the past four years, Bloomberg notes. 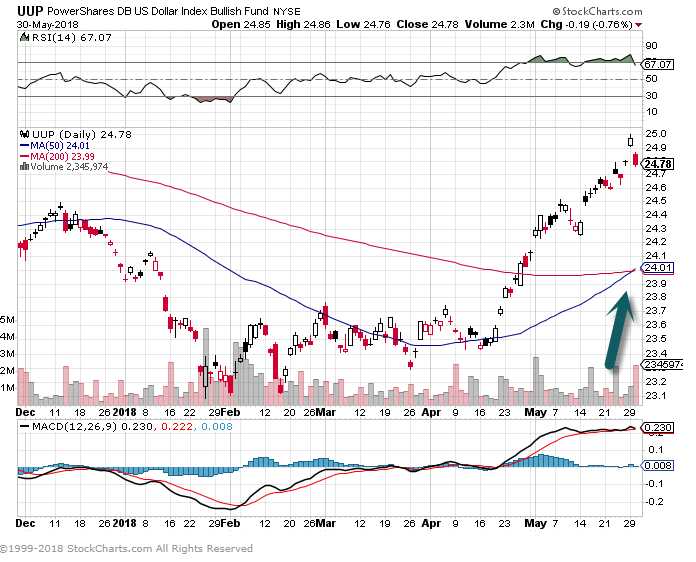 50 day thru 200 day to upside. 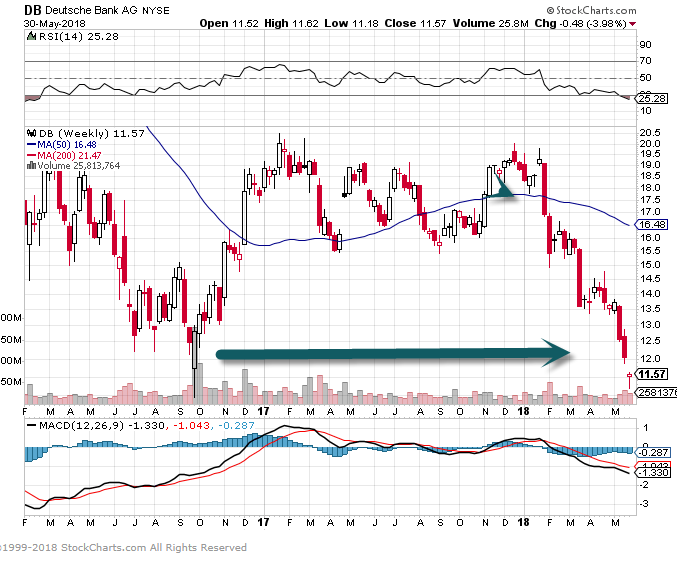 3.Euro Banks Break Below 1 Year Line. 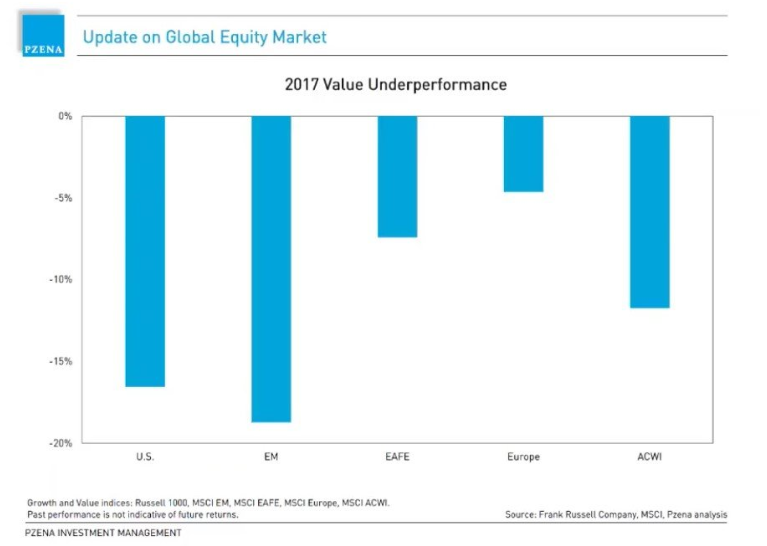 Deutsche Bank back to 2016 lows. 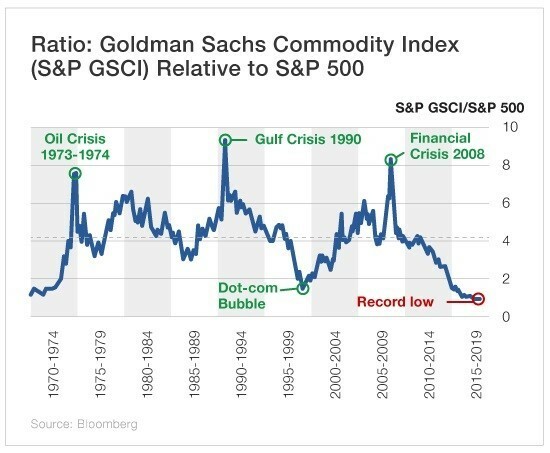 4.Ratio of Goldman Commodity Index to S&P 500 Hits Record Low. 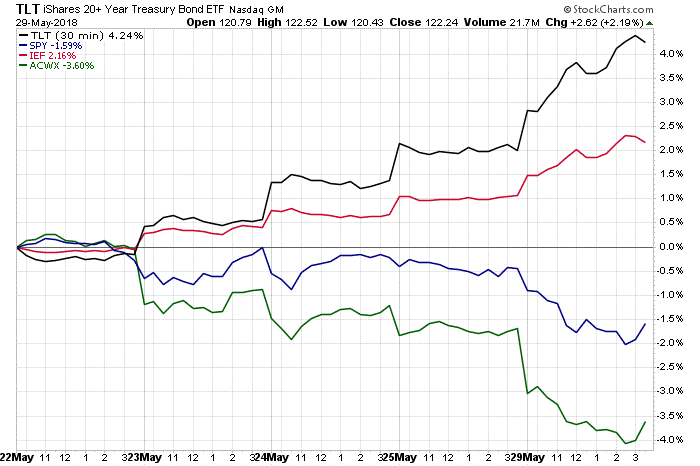 5.Bonds Did What They Are Supposed to Do During Volatility. The most recent numbers from S&P/Case-Shiller came out this morning and showed increased home prices on a month-over-month and year-over-year basis for every city tracked. Below is a table highlighting each city’s change in home prices for March (the data is released on a two-month lag). As shown, Seattle — home to Amazon.com — continues to see the biggest gains, with a month-over-month gain of 2.84% and a year-over-year gain of 13%. San Francisco was also up 2%+ in March, while another ten cities were up more than 1%. New York was up the least month-over-month at just 0.08%, which was even weaker than Cleveland’s +0.35% gain. 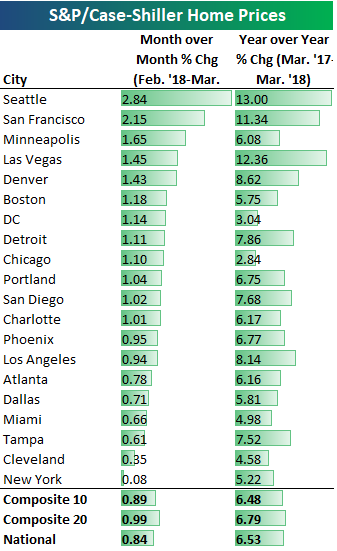 Year-over-year, Seattle, San Francisco, and Las Vegas were the three cities up 10%+, while DC and Chicago were up the least at 3.04% and 2.84%, respectively. Below we show where home prices currently stand versus their high points during the housing bubble of the mid-2000s. 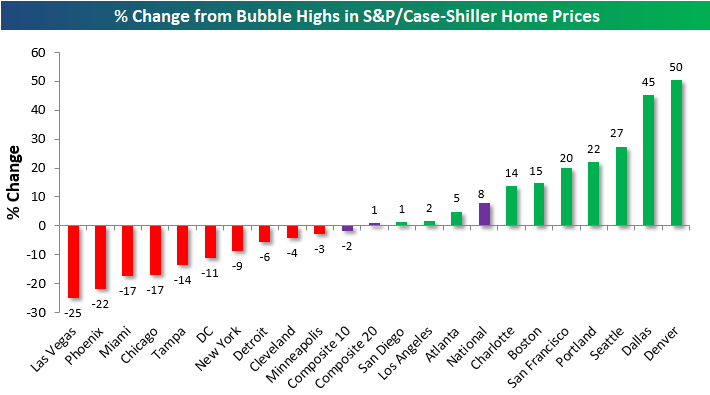 Ten cities are currently above their prior bubble highs — meaning they’ve recently hit new all-time highs — while ten cities are still below. We can also see how much home prices are up off of their lows following the housing bubble burst in each city. As shown, the national and composite 10 and 20 city indices are all up roughly 50% from their lows, while San Francisco is up the most at 118%. While Vegas is still the furthest below its housing-bubble highs at -25%, it’s up the 2nd most off of its lows at +93%. This is a reminder as to how crazy things got for Vegas home prices back in the mid-2000s. We noted earlier that New York and Cleveland showed the smallest month-over-month gains this month, and these two cities are also up the least from their lows (just 25%) following the housing crash. DC, Chicago, Charlotte, and Boston are the other cities that are up less than the national indices. 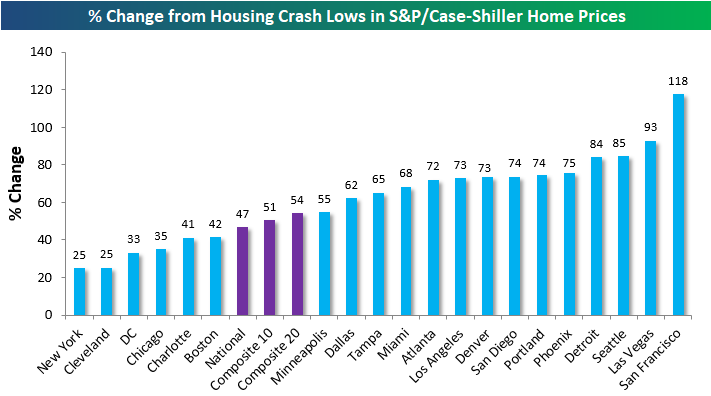 Finally, below are charts of the S&P/Case Shiller home price indices for each city tracked. Cities highlighted in green are currently at new all-time highs. Bird electric scooters are taking over San Francisco. Electric scooter startup Bird is riding high these days. On Tuesday, Bloomberg reported that Bird is raising $150 million in a Series C funding round led by Sequoia Capital, which will value the company at $1 billion. The company has worked aggressively to cover the streets and sidewalks of San Francisco, as well as other US cities, with motorized vehicles that are like Razor scooters for grown-ups. People can reserve a local scooter from a smartphone app, ride for a small fee, and leave the scooter anywhere at the end of a journey. Led by a former Uber and Lyft executive, Bird has previously raised $115 million to expand nationwide. But the company’s rise to success hasn’t been without speed bumps. Starting on June 4, San Francisco will ban scooters from companies including Bird, Spin, and Lime, unless the companies operating the vehicles have a permit. I pass at least a dozen electric scooters on the streets of San Francisco on my daily commute, so I recently rented an electric scooter from Bird to try it for myself. The Bird has landed in San Francisco, and people have very mixed feelings about it. “A few weeks ago, I had not noticed any electric scooters in SF. Now you can’t exit a building without tripping over one,” M.G. Siegler, a general partner at Google Ventures, tweeted in April. It’s true. Starting in March, three startups — Bird, Lime, Spin — rolled out hundreds of motorized scooter rentals in downtown San Francisco in the span of a few weeks. Now they’re everywhere. Some people have commended the scooter startups for giving people a cheap, easy way to get around while reducing their reliance on cars and easing congestion on public transit. Others are annoyed. The proliferation of scooters has created crowding on city sidewalks, because the vehicles don’t use docking stations like some electric-bike-sharing startups. I wasn’t sure where I stood on the issue, so I decided to give Bird a whirl. Honestly, this thing just looks fun to ride. It’s a stand-up vehicle like the Razor scooter that I cruised around on as a kid. But the Bird scooter is tricked out with a motor and a battery. It reaches speeds up to 15 mph. By comparison, Uber’s JUMP bikes top out at 19 mph. After downloading the app and creating a login, a map appeared showing me nearby Birds. The closer I zoomed in, the more detail I could make out — like each scooter’s battery charge. When you find a Bird near you, you tap the button to unlock it. The app prompts you to snap a photo of the scooter’s QR code and (on your first rental) scan your driver’s license. Renting a Bird costs $1 to unlock and 15 cents per minute of use. I was ready to ride! To start the scooter, you kick off three times, then push the throttle button with your thumb. I won’t lie: The kid in me who cruised around on a Razor scooter enjoyed the heck out of my first @BirdRide spin. The scooter responded to the lightest touch. There were a few lurches in the beginning as I learned how to handle the acceleration, and I was glad to be in an alley away from traffic. Almost immediately, I understood the appeal of Bird. It was fast, fun, and easy to maneuver, though I didn’t feel comfortable turning corners. Instead, I applied the brake and pedaled. In a construction area with uneven pavement and loose gravel, the Bird handled the road like it was skating on ice. The extra-wide tires provided a smooth, comfortable ride. The footboard was plenty wide for my feet, but I imagine it would be a tighter fit for men. The footboard had some reminders: State law requires scooter riders to wear a helmet. You must be over the age of 18, have a valid driver’s license, and ride one person at a time. Seeing as I didn’t have a helmet, I stayed in my comfort zone: The alley. Bird has been giving away free helmets to active riders since February, and I placed an order after my ride. The helmet actually costs $1 to cover the cost of shipping. To end the ride, I opened the app and tapped the button to lock the scooter. The app showed me a ride time of 13 minutes and a cost of $2.95 — a fraction of what my typical Uber ride costs. I could see myself using Bird or another electric scooter-sharing company to reach parts of the city where there’s heavy traffic, so I could cruise past ride-share cars in the bike lane. To help prevent littering, Bird has made a pledge to pick up all its vehicles nightly. It sends a team of employees and independent contractors called “chargers” to retrieve the scooters, charge them, and deploy the next day in areas where Bird predicts they will be used. Doing these things could actually make you feel worse about your life. Your emotions affect every decision you make. They impact your relationships, your work life, your psychological well-being, and your physical health. Studies show your emotional skills can even determine how successful you’ll be. Despite the huge significance emotions play in your life, there’s a good chance you don’t think about your feelings very often. Most people don’t. People rarely talk about feelings and most of us weren’t ever taught how to deal with them. 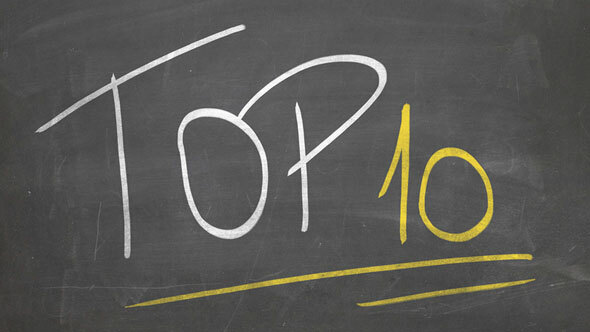 Consequently, most people—even smart, successful people—are making some emotional mistakes. You probably wouldn’t deny that you had a cut on your leg. We tend to treat our physical wounds without a second thought. But, you might deny your emotional wounds. Whether you minimize how you feel by saying, “I don’t really care that I didn’t get that job,” or you outright deny your emotions by saying, “No, I’m not angry,” most of us try to act like we’re not in pain sometimes. But, downplaying your emotions won’t make them go away. Many people think suppressing their emotional wounds means they’re mentally strong. In reality, they’re just acting tough. It can be uncomfortable and embarrassing to admit your struggles. But acknowledging your emotions is key to making your best decisions—and it’s fundamental to addressing your psychological pain in a healthy way. You have to allow yourself to feel uncomfortable to grow as an individual. And you have to experience negative emotions if you really want to experience positive feelings. Keep in mind that if you felt happy all the time, you wouldn’t appreciate it. Every time you face uncomfortable situations head-on is an opportunity to gain confidence in yourself. When you learn you can tolerate discomfort, you’ll be more willing to face your fears and step outside your comfort zone. But, chasing happiness backfires. Insisting that you should feel happier will ruin the moment. The idea that you aren’t happy enough puts pressure on you to experience more joy in your life. And racing from one activity to the next trying to force happiness is one surefire way to feel worse about your life. But instant gratification and overindulgence will make you miserable over the course of the long-term. Self-discipline—which requires you to tolerate some level of discomfort—will help you feel happier over the course of your life. Emotional skills are like any other skill—you can get better with practice. But before you can improve, it’s important to take stock of some of the emotional mistakes you might be making. The best news is, learning how to regulate your emotions is one of the three core factors of mental strength(link is external). Sharpening your emotional skills will help you build the mental muscle you need to reach your greatest potential.